I pulled out a Hanglar Stanglar image and colored it up this afternoon. It's been a while since I've just one of these images. I love it though, and it's perfect for a card that's all about love. 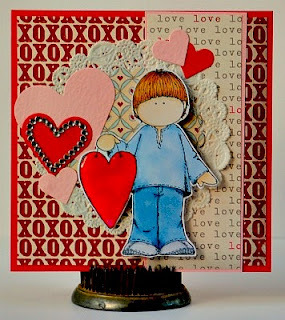 I used B93,95, 97 to color up the boy and then used R29 for the heart. His skin was colored with E50, 53 and his hair was colored with E33, 35. I'm using up a new of my valentine paper scraps too...that's always a good thing. This is just adorable! I love the hearts everywhere! Thanks for joining us for this week's sketch! What a lovely project! Thank you so much for playing along with us at Allsorts this week and good luck! Eine wundervolle Karte ist das geworden, dane für deine Teilnahme bei LHO und viel Glück.